Many continuing education ethics programs are generic in nature. Many continuing education ethics programs stress risk management strategies to the detriment of the attendees, especially if an attorney presenter is involved. This program is different. 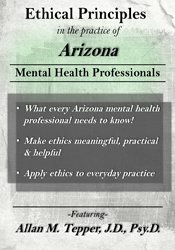 Rather than avoiding clinical issues, this program explores the manner by which clinical and ethical issues effect the everyday practice of the mental health professional in Arizona. This unique blend of clinical and ethical concerns allows for a more meaningful understanding and interpretation of the rules that govern mental health practice. These goals are reached through the experience and the interactive style of the presenter, Allan M. Tepper, J.D., Psy.D. Different from other individuals who possess joint degrees in psychology and law, Dr. Tepper actually maintains an active psychology practice and an active law practice. He functions as a clinician, and he represents mental health professionals who experience legal difficulties. In this regard, Dr. Tepper brings an extremely unique perspective to the practical understanding of ethics. These goals also are reached through the manual utilized in the seminar. The manual materials are not generic in nature. All of the written materials are state specific to Arizona. When interacting with an attorney, it sometimes is difficult to hear the words, “Trust me.” For this seminar recording, however, we do say, “Trust us! !” We guarantee, you won’t walk away disappointed. Determine specific state and administrative laws that are pertinent to establishing and maintaining an ethical clinical practice. Determine which notes, documents, reports, forms, and clinical data constitute an official medical record in the state of Arizona. Evaluate your current record-keeping practices in order to ensure compliance with ethical and legal requirements in the state of Arizona. Designate the treatment provider’s responsibilities relating to mental health issues and duty to warn law in Arizona. Explore the legal and ethical considerations for the treatment of minor populations in Arizona with regard to age of consent, confidentiality and custody concerns. Allan M. Tepper, J.D., Psy.D., is engaged in the private practice of both law and psychology in Philadelphia, Pennsylvania. As a psychologist, he specializes in forensic matters and has testified on numerous occasions in cases involving civil, criminal, domestic relations, and death penalty issues. As an attorney, he has extensive trial experience, including the representation of mental health professionals in ethics and licensing board proceedings. He has been an adjunct faculty member at Widener University in the Institute for Graduate Clinical Psychology, and at the Philadelphia Chapter of Great Lakes Colleges Association, and an adjunct assistant professor at Immaculate College, Graduate School. Dr. Tepper conducts ethical training for mental health professionals through the United States and is well-known for his engaging style. He publishes frequently in the areas of law and psychology. He is co-author of Pennsylvania Law and Psychology – Third Edition, and Pennsylvania Law, Ethics, and Psychology – Fourth Edition. He received his J.D. degree from Albany Law School and received M.S. and Psy.D. degrees in clinical psychology from Hahnemann University in Pennsylvania. Visit his website at www.allanmtepper.com. Non-financial: Allan Tepper has no relevant non-financial relationship to disclose. PESI, Inc. designates this self-study activity for a maximum of 6.0 AMA PRA Category 1 Credit(s)™. This activity was originally recorded on 12/14/2018. It was last reviewed on 12/26/2018 and is valid until 12/26/2021.